I haven't yet played TNA but love what I've seen so far. However, for 6k I could have any early Bally I wanted. Or even a few. Can anyone that has significant time on TNA and games such as Centaur or Fathom make a fair comparison? Obviously, sound and display are way ahead of any classic solid-state game. 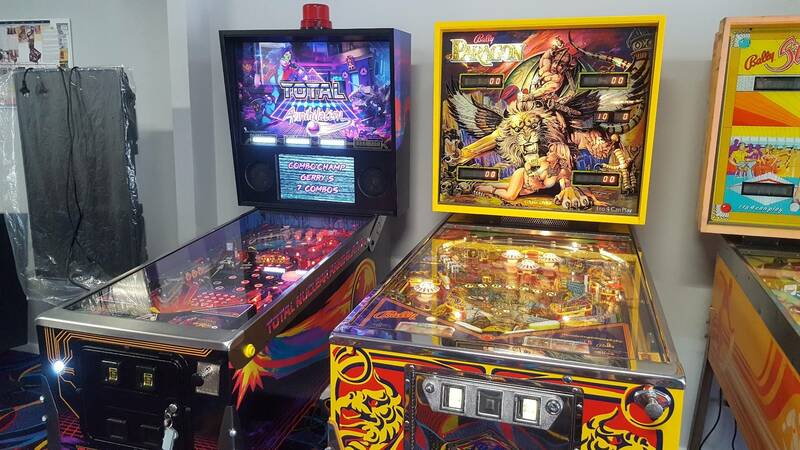 But the playfield design resembles games of that era and I would think draw those comparisons rather than remakes or new Sterns. Personally, I'm interested in TNA because it IS different from other new games. TNA for me and it’s not close. You’re going to spend the same amount of money and get a game that is vastly superior in lighting, sounds, display, and rule set. Not to mention you’ll be supporting an awesome company in Spooky and dude in SD. The only thing that TNA lacks in is the art dept. (for me) but basically impossible to compete with some of those early SS games. But that’s super low on the priority list for me. I own a TNA and have owned Centaur and other early Bally ss . I love early Bally ss games but it is not even close, TNA wins . Both at this point. I really enjoy early Bally SS's and own a Fathom and EBD. I've played TNA and have one on the way, but I'll need to get a lot more games in on it before I can make a final judgement. I’d take TnA over two great 80’s SS. I would get TNA now while you can... Early Bally SS games you can find and have restored anytime you want. TNA will be HARD to find in the not so distant future. I’ve had a bunch of 80s Ballys. Only one that’s stayed is Flash Gordon. See if I keep that after my TNA arrives. Centaur and Fathom are the top of the class of 1981. I don't expect anyone to try to capture that specific set of qualities now or ever again. It would be too expensive and too risky to try to emulate 1981 again -- especially without a licensed theme. Gotta love Centaur. That's why TNA is going right next to it! It's a tough one and I guess it would have to be on personal preference.. TNA is a throwback with some modern touches which makes it so attractive for us. I don't think you could go wrong with either choice honestly. I was able to find Spooky's # on the web, TNA should be available for order for quite some time. Please let me know what the phone # is to order any of these prodject Bally's from. I don't think TNA will be hard to find in the future. Every "keeper" eventually comes up for sale. AMH was commanding near 10K prices during its manufacturing run because of its limited (150) number. But I had 3 second hand ones to choose from when I went looking for one last year. At the slow build pace, there will probably be some used TNA's available before current orders are filled. This is an interesting thread because I've contemplated the same question. I agree with this... in a year+ there will be plenty of TNA popping up! I haven't played TNA yet, but I have played a lot of early Bally and Stern SS titles, and I look forward to playing TNA at TPF. I think TNA is a great option for someone that wants a pin with an 80s feel, but doesn't have the technical skills to repair older 80s pins. An added bonus is if someone buys a TNA and really likes it they will start looking at the 80s pins that inspired it. I would stick with the classics. Plus the art package in almost all of them is outstanding. I don't think TNA will be hard to find in the future. Every "keeper" eventually comes up for sale. AMH was commanding near 10K prices during its manufacturing run because of its limited (150) number. But I had 3 second hand ones to choose from when I went looking for one last year. I mean, that's great for you and two other people, but the 4th guy is out of luck. All games move around, even the super rare ones change hands. But the pool to pick from dictates certain realities, and how much time and patience you're willing to put in is a real factor. I really love the 1980/81 Bally games. I've had Flash Gordon, Eight Ball Deluxe, Fathom (thanks to snaroff for the loan of a beautiful game), Fireball II, Mystic, and Medusa. I'd still like to own a Centaur, just not big on the price for a decent one. Great games. But TNA is really the perfect game for me, all the things I like about the old titles, with all the modern upgrades I've come to enjoy too. Picking up a title like Flash Gordon for $2k or the like, great. Spending the $6k for a nice older title? For that cash I'm more into TNA for sure. I hope they make a ton. But it's realistically going to be like a Cactus Canyon, rare-ish, available, but not something you can just casually grab. I’d be interested to see what spooky considers a slow enough slow down to stop making them and do their last call. I think they should at least go through 2019 as to allow time for the masses to get their hands on it and to see their reliability. Yeah, it really does depend on how many Bally's you could get. Centaur and Fathom aside, I would get a bunch of early SS titles. Those two are over priced in my opinion, but the vast majority of great early SS Bally and Stern games are not. Look into them. You will be pleasantly surprised. I also think TNA is a great game but not compared to 4-5 early SS. Just a humble opinion. Why choose? Sell one of those 90's B/W games and get a TNA and a 80's Bally or early stern. Tempting, and I've thought about it. Especially because I play a ton of multiplayer games and TNA is supposed to be good for 2 players. I've been lucky enough to own a Fathom and after a while it was just an art piece that didn't get much play. I much prefer Centaur and Medusa, or even some others like Skateball. These Bally's are addicting and I don't think I could stop at one. I have TNA next to a high end restored paragon.